No, not the newspaper. I mean some contempo sounds returning us to the States, after our last globe-trotting exercise. New Wave legends Devo, believe it or not, released a surf album in 2001 as "The Wipeouters." True, they're from Ohio, but they've been here in LA for so long that they seem to have soaked up enough sunshine to make an excellent, mostly instrumental collection of wild 'n' wacky guitar rock, with touches of exotica, electronica, and cartoonish sound effects. There aren't any songs on the order of, say, "Mongoloid" or "Beautiful World" but, somewhat to my surprise as I had written this band off by the mid-'80s, it's an entertaining album I've played almost as much as their old classics. They even sample the "Shut Up Little Man" guys! 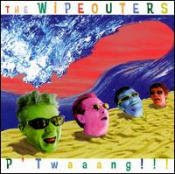 The Wipeouters: "Surf's Up On Goon Island"
The Bonedaddys are a veteran LA club band with strong ethnic/exotic influences whose latest album features a song mixing surf guitar with African drumming. Which I think is a dandy combination. RIAA: "It Is Such A Good Saturday Night"
Have an unsafe and insane Fourth! hey there. i thought you might like my music/sound collage radio show "The Nether Regions." it's at www.candle-ends.com. I'm just starting to actually promote it, though it's on the 7th episode.